West Farm is a three bedroom Cumbrian farmhouse, brick built and rendered in a traditional style. The property benefits from two spacious reception rooms. The sitting room and the dining room both feature open fires and bay windows. The generous kitchen has an oil fired Aga and modern fittings, along with ample space for a kitchen table and chairs. A ground floor bathroom has a modern electric shower, wash basin with storage and WC. To the first floor there are three generous double bedrooms served by a family bathroom. The property is in need of general refurbishment. A range of traditional farm outbuildings stand on the site, a number of which will be demolished before building can commence of the nine new residential properties. There is outline planning permission for the construction of the new buildings including access, layout and scale. The vendor will consider part-disposal or a phased joint venture. The site is sold with the benefit of outline planning permission for the erection of nine residential properties, including layout and means of access. The permission was granted on 20th October 2017 by Allerdale Borough Council (Application Reference 2/2015/0470). 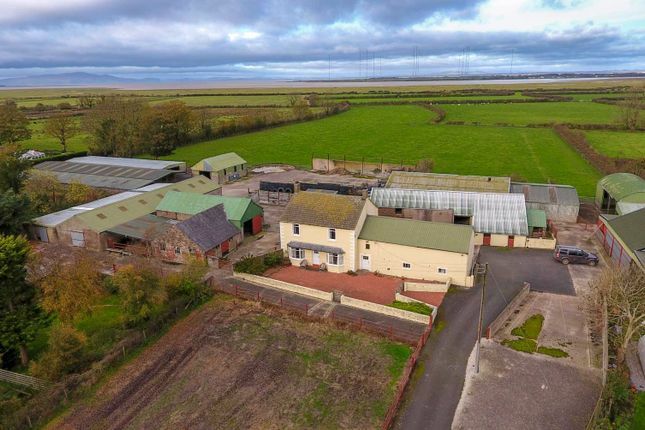 Newton Arlosh is located a short drive from the Solway Firth and less than 15 miles from the regional capital Carlisle. For the outdoor enthusiast the surrounding area offers excellent walks and sporting opportunities being close to the Lake District National Park. Carlisle is within easy reach, providing an excellent range of social, leisure and retail opportunities and an attractive pedestrian area, along with an impressive cathedral and castle. Other regional centres such as Penrith and Keswick are also very accessible. For the commuter, there are good road links for access to Carlisle and the property is also within easy commuting distance of many regional centres. The M6 is within easy reach and can be accessed at several junctions depending on the onward journey north or south. Main line rail services are available at Carlisle providing fast and frequent services to London in the south and Glasgow in the north. The rail station at Carlisle provides regular connecting services east to Newcastle. Property descriptions and related information displayed on this page, with the exclusion of Running Costs data, are marketing materials provided by Finest Properties, and do not constitute property particulars. Please contact Finest Properties for full details and further information. The Running Costs data displayed on this page are provided by PrimeLocation to give an indication of potential running costs based on various data sources. PrimeLocation does not warrant or accept any responsibility for the accuracy or completeness of the property descriptions, related information or Running Costs data provided here.